is for you: $5 for one admission to the Wildlights holiday light display (up to $14 value) at the Columbus Zoo and Aquarium. For the past 24 years, the Columbus Zoo and Aquarium has been spreading holiday cheer with its annual Wildlights holiday light display and festival. From the millions of holiday LED lights, to the Magical Tabernacle Forest Chorus, the Wildlights event is a holiday tradition for locals. This year’s festival features live music and a new attraction called ‘Global Celebrations’, which is a newly designed eight-minute music and light show on Conservation Lake. Today’s Google Offer for the Columbus Zoo and Aquarium also includes general admission to see the zoo’s 700+ wildlife species and exhibits. To subscribe to Google Offers in these cities and other locations across the U.S., please visit: www.google.com/offers. You can also find and buy great deals with the free Google Offers app for Android. 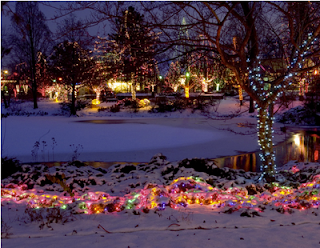 If you live in the Columbus, OH area and are looking for something fun to do with the family this holiday season, then today’s inaugural Google Offer is for you: $5 for one admission to the Wildlights holiday light display (up to $14 value) at the Columbus Zoo and Aquarium.